If you search this question around the internet, you will find prescriptive information advising you to clean your tank every three to five years. BUT the reality is, there is no one-size-fits-all approach. Would your mechanic tell you to change your car tires every three years? A tire wholesaler might, but your mechanic would assess your tire tread and let you know when it is time to alternate or change those tires. Some people simply drive more than others, so a prescriptive standard is just not practical. In some cases, two years is correct. In many others, well over 8 is more effective. Septic tanks are no different. Since 2005, in response to regulation changes, septic designers have been sizing tanks larger relative to expected home occupancy. So, today, tank pumping intervals have increased. Modern (larger) tanks with normal usage may go over eight years while some older (smaller) tanks with high usage should be pumped every couple of years. The septic tank is just one component of your system, but it’s a very important one. This simple technology, originating in France around 1860, has saved countless lives by helping mitigate the spread of disease-causing viruses and pathogens. You should compost your kitchen scraps and avoid throwing coffee grinds and bacon grease down the drain. ﻿How do septic tanks work? To understand when a septic tank should be pumped, it helps to understand how the tank works. The basic process is biological, with microorganisms digesting the compounds in your wastewater. Simply put, the heavy stuff sinks and creates sludge, the lighter stuff floats to the surface creating scum, and the murky water flows on. Living in these three zones are millions of species of microscopic bugs. These little creatures are responsible for metabolizing and pre-treating your wastewater before it finds its way to the soil dispersal & natural environment. A pumped clean tank may take months for a culture of strong bacteria to re-form. When a tank has been in use for some time, the solid layers will generally accumulate to a point when it is time for a cleaning. How are tank solids measured? A sludge judge is the tool commonly used to measure when a tank should be pumped. It’s a device used for — you guessed it — measuring sludge. A standard rule of measurement is that you’re due for a pump out when the solids (scum + sludge) accumulate to about 30 – 50% of the total volume your tank, estimated, while considering the arrangement of your system as a whole. Have your maintenance technician measure levels in your tank every couple of years during routine maintenance and monitoring of your entire system. This way, you can be sure not to over or under pump, both of which, over time, can cause problems in the dispersal field, take a nasty bite out of your pocketbook and negatively impact the environment. A typical tank sized to today’s standards for a three-bedroom home is about 1,000 gallons. If your home has low occupancy and you are mindful not to flush products that might harm those good bacteria, you may be able to go well over eight years between pump outs because the little bugs are keeping up with digestion. This is good news because sewage disposal rates are only getting higher. That 1,000-gallon tank in the Greater Victoria area will cost over $500 to have pumped,. How much does a pump out cost? If you have six people living in your home and your tank is less than 600 gallons, you should have it pumped every couple of years. Or if you want to see long-term benefits to both your downstream environment and your bank account, give some thought to having a larger tank installed. Why ever pump the tank? Studies have shown that, for proper treatment and a long-lasting dispersal field, the water from a flush should be retained for a period of time before it leaves the tank. In British Columbia we design for 3 - 6 days retention, meaning water from your shower this morning may not enter the natural environment for another six days. As solids accumulate in the septic tank, space for water decreases along with subsequent retention time. This allows suspended solids to leave the tank and plug up your dispersal field, clogging the soil in your yard and further downstream. 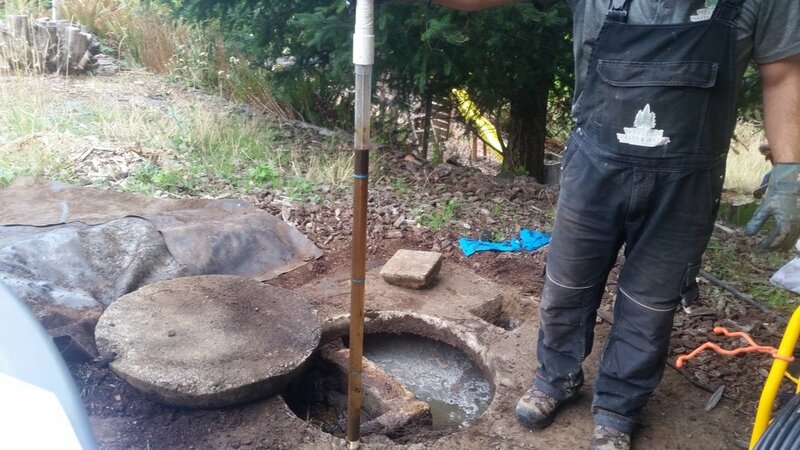 Get more bang for your maintenance buck by having a registered maintenance person maintain and monitor your entire system, not just your septic tank or treatment plant. Your money is often better spent having and effluent filter installed, flushing your laterals and equalizing flows in your dispersal area. Checking the levels in the tank every couple of years, among other important tasks, should be part of a maintenance and monitoring PLAN tailored to your system and your home’s usage.